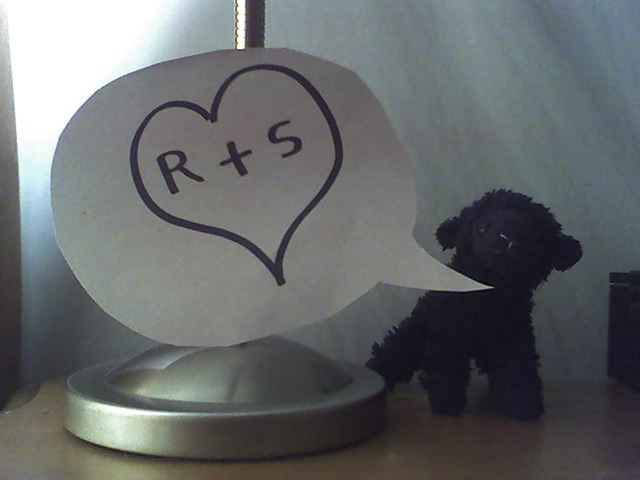 I have a diminutive stuffed black lamb that Sam occasionally uses to ventriloquize his moods. Sometimes, for example, the lamb is too excited and wound up to sleep, so he gallops around the bedroom, up the walls, and across the ceiling. Sometimes, when he’s so happy he’s ready to burst, the lamb stands up on his back legs and does a little dance, front feet clasped in Sam’s hands so he can dance along as well. Occasionally, when I’ve been immersed in my own work for too long, my field of vision will be interrupted by an airborne, somersaulting lamb, who has decided to circumnavigate the room via a trajectory that passes between my eyes, and whatever project I’m working on. When I look up, Sam is invariably sitting still, facing some other direction, looking innocent. There are more radio stations than you might think in the rural, remote stretches of northern Utah and central Idaho. If you happen to be driving through, you will rarely be at a loss for a signal. Interestingly, many of the stations I found on my most recent trip had play lists built around emo-core, metal-inflected, industrial rock – but with surprisingly well-articulated and soulful lyrics. A lot of intelligently worded songs ground out by boys who sounded like they were very, very bad. A lot of homage to 80s guitar-centric music, but with contemporary, sophisticated, nuanced production values. A lot of stories about love, without the self-hating/other-blaming/furious/cheating/betrayal and general amourous mismanagement one expects from a rock song. It was like discovering a whole new country that had accepted Linkin Park’s sound, but not their whining. And all this in one of the most conservative, and unpopulated parts of the country? Who would have guessed?!? There it was; I’d been had. All those gravelly-voiced bad boys on the radio were emoting about “You” with a capital and omniscient “Y”, not “you,” the earthly object of their adoration. Rocking out just isn’t quite as satisfying when there’s an agenda. For as long as I can remember, I have occasionally processed sensory input in unexpected, unpredictable, yet entertaining ways. Not too long ago, for example, I was sitting at a stoplight waiting for it to change. I was thinking about something, and both my mind and my gaze were off in the distance. The stop light was still within my peripheral vision, but it wasn’t my focus. Suddenly, my thoughts were interrupted when someone hit me in the side of the head with a large, firm pillow. “Wh-what?” There was no one else in the car, nor were there any pillows. And my window was rolled up, preventing any drive-by pillow-thwacking by well-coordinated strangers. I was deeply perplexed, until I realized that the stoplight had changed from red to green; calculating backwards, I realized that the thwack had corresponded precisely with the changing light. I had seen it happen, I just hadn’t processed it. Not visually anyway. The other night I was lying in bed, eyes closed, enjoying the thunderstorm unfurling outside my window – a rare treat in southern California. Suddenly, the velvety darkness of the insides of my eyelids was startled into brilliant white – a fine mesh of light danced across my gaze. Strange, until I realized that a second ago there’d been a clap of thunder. I hadn’t heard it at the time, but there it was, vibrating in my short-term memory banks when I went searching for an explanation for the unexpected visual apparition. I thought everyone had these experiences from time to time until a few years ago, when I was describing them to a good friend who has a PhD in neuroscience. Fascinating, to watch her eyes change as she began regarding me as someone with a “neurological phenomenon”; fascinating to switch from thinking I was normal to realizing that a lifetime of experience tells me that I’m not. Apparently, I have synesthesia – a condition in which sensory data stimulates one sense, but is read or interpreted by another. Tasting colors, for example, or seeing music. I’d heard of synesthesia before, but I’d always associated it with people who used crazy psychedelic drugs, or artists and philosophers who used it as a metaphor. I didn’t really realize that it was real. It certainly never occurred to me to think I had it. I’ve started paying more attention to my synesthesia, now that I know that it’s unusual. It would seem that mine is pretty consistent – under certain conditions I will, automatically, interpret sound visually, or feel color. When I have one of these experiences, I don’t hear the original sound or see the original color; I experience it first synesthetically, and only “remember” that it was a different kind of sensory data after the fact, when I go searching around in my head for an explanation. Further, certain kinds of sounds always “look” the same. For example, short, sharp sounds appear as jagged gashes of light – almost like comic book style lightening – with the number of lines determined by the discernable tones in the sound. If a slamming trash can lid elicits a three-stroke gash of light across my field of vision, upon reflection, I will realize that there were three discernibly distinct sounds in the slam – once I’ve gotten over the fact that I didn’t hear it slam at all, and have found it swimming around in my memory. I should note, as a disclaimer, that I haven’t been diagnosed as having synesthesia by a medical professional; but I did see that look in my neurologist friends eyes! And as I read through Wikipedia’s lengthy description of synesthesia, I was stunned to recognize myself and my experiences so completely. I was especially moved – almost to tears – when I discovered that one strain of synesthesia involves the personification of concepts or inanimate objects. The synesthete will, automatically and consistently and in the absence of any particular reason, associate certain personality traits with objects or concepts. This couldn’t have resonated more with my experience of the world as a child. For years – and long before I knew enough about language to understand the broader cultural and linguistic implications – I simply knew that “left” was bad and “right” was good. Similarly, forks were “bad” – cunning, nefarious, and untrustworthy while spoons were “good” – gentle, reliable, and kind. This certain knowledge didn’t interfere with my life at all – I still turned left and used forks. I simply knew that they had specific, fixed character traits. On a much more emotionally difficult level, I was often paralyzed by my personification of objects. Many children personify toys, but I personified everything – and felt like I didn’t have a choice. There was no intentional imaginative projection involved, it was simple, repetitive, automatic. I remember one especially traumatic episode when I was eating a sandwich in the car and a few small pieces of cheese fell off, onto the green carpeted floor. As I watched them lying there, amongst the dust, my throat closed up and choked me with the bit of sandwich I hadn’t fully swallowed. My eyes filled with tears, and I was miserable for a good many hours. The grief was overwhelming. I remember battling this rampant personification, wishing I could turn it off, completely failing to understand how anyone could move through the world without tripping over the personalities, desires, and emotions of all the objects around them. I still struggle with this as an adult, though I have developed some coping mechanisms. My anti-materialist purges correspond, at a practical level, with my need to travel lightly. But at a much deeper level, they speak to my psychological need to not be beholden to objects, to limit the opportunities for personification. I recently attended a concert by a phenomenal percussionist – Dame Evelyn Glennie. Glennie is the only person to have ever built a successful career as a solo percussionist. She’s scored films, won Grammy’s, collaborated with the worlds best musicians, and produced numerous CDs. Watching her live, I was uneasy a number of times when I realized that her hands move faster than I’ve ever seen any human hands move. She pulled nuances and subtleties out of her instruments that were astonishing; she lingered over tonal variations, and sculpted resonance while it was still hanging in the air. I’d heard before the concert that she was deaf, but I completely dismissed the possibility while watching her play. But after the concert I looked her up and yes, in fact, she is deaf. In a statement that has caused much controversy, Glennie claims that she’s taught herself to hear using senses other than her ears. I believe her implicitly – I don’t care if the statement is controversial because, though I can neither control nor predict it, I do occasionally hear things with my eyeballs, and see them with my skin. They are mundane things – thunder, a slamming trash can, a changing stoplight. But I wonder how much further the human senses can go? Once, when I was about five years old, I watched my mother come down the stairs at night. She was surrounded by an outline of bright blue light. Interesting, I thought to myself, then promptly fell asleep. Given my adult experiences with synesthesia, I now wonder if I was picking up on some kind of auditory input and translating it into the visual. Was her body humming? Was I seeing some kind of sound that no one – including myself – could really hear? In later years I tried, consciously, to see lights around people’s bodies, and never managed to do it. But by then I was trying to use my eyes to see – going about it all wrong. Apparently 1 out of 23 people have some kind of synesthesia. It is sometimes, but not always, hereditary. Many synesthetes never realize that their experiences are unusual. Often, synesthetes describe the experience as pleasurable and some use their abilities to enhance their creative production. Personally, I’m quite pleased to discover that I have a super-power. But there’s a deeper, and more thoroughgoing pleasure that comes from my new, retro-fitted understanding of myself and the way I experience the world. Discovering that I have a neurological phenomenon has somehow relieved me of feeling like I ought to change; and allowed me to simply observe. It may be that I will always experience excruciating emotional pain when I abandon objects along the way; but maybe I just can’t help it because I’m wired that way. And maybe along with that pain comes the ability to occasionally see the invisible. I have a love/hate relationships with cafes in Los Angeles. Evenings and weekends, without exception, every Starbucks, Borders, Barnes & Noble and Coffee Bean & Tea Leaf in town is filled with People Who Are About To Be Stars. You sit down with your coffee and your laptop, and as soon as your ear starts to sort out the buzz of low-toned conversation, you realize that everyone is on the phone with their agent, their manager, their writing partner, their stylist, their publicist. Everyone has a blog. Everyone’s working on their first novel. Everyone just sold a screenplay. Everyone went to an industry part last night. Everyone’s going to a promotional event next weekend, then to Vegas for a week to chill out. Occasionally, you’ll pick up bits of conversation that reveal what all these people do during the daytime – jobs which are just the same as those held by everyone else in coffee-shops across the country. This would seem to be a community of otherwise ordinary folk, who are convinced that with enough ambition and perseverance, they’ll overcome staggering odds and a lack of industry connections and break into the artistic/entertainment career of their dreams. I love them! I hate them! What a novel experience, to feel like I belong somewhere! How terrifically irritating, to be just like everyone else!